Every year approximately 50,000 Americans die from colorectal cancer. A month-long Mayo Clinic social media campaign aims to change that. For those of us in the Midwest, it's common to want to wish away March and get on with spring. But doing so would mean the end of March Madness. National Colorectal Cancer Awareness Month would also be, ahem, behind us, and that's too important to miss. That's why this year Mayo Clinic launched a month-long social media campaign to raise awareness about colorectal cancer and let you (yes, you) know how important regular screenings and early detection are to saving lives. But don't take our word for it. Just ask Greg Krueger, the 46-year-old husband and father from Jacksonville, who Florida's First Coast News reports has become part of the "alarming rise in colorectal cancers among younger patients." That includes those in their 20s, 30s and 40s who aren't yet to the age of generally recommended screenings and who don't have a family history of the disease. In Greg's case, First Coast News reports that his diagnosis came after a visit to Mayo Clinic's Florida campus in October 2017. And while his diagnosis was unexpected and unnerving, he says the emotional blow was softened by his care team. "One of the most comforting things said was by the surgeon I met the first day," Greg tells the paper. "He said, 'You're not going to die from this.'" That comforting declaration was made, First Coast News reports, because Greg's cancer was found early and because of advancements in treatment. "That's where the individualized medicine and specialized medicine offers that hope and promise," Pashtoon Kasi, M.D., M.B.B.S., a hematologist/oncologist at Mayo Clinic, tells the paper. For Greg, that meant starting chemotherapy immediately following his diagnosis, the paper reports. And though he has "months of treatment left until the last cell of cancer is gone," Greg tells the paper he "considers himself fortunate" that his cancer was found early, and that he has his family and his care team at Mayo Clinic on his side. "It's something you fight for, it's something you don't give up, it's something you keep looking for — that hope," he says. To give others that same hope, physicians from Mayo Clinic's campuses in Florida, Arizona and Minnesota are participating in a series of short videos designed to offer information related to the prevention, diagnosis and treatment of colorectal cancer. A new video is being released every day throughout March, and all of the videos can be found on Mayo Clinic Connect, as well as Mayo's Facebook, Twitter, Instagram and LinkedIn pages. 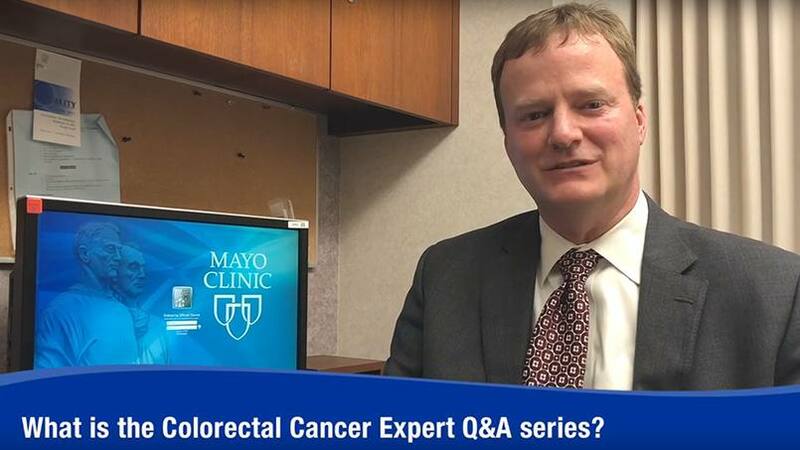 While each video covers a different topic, Mayo Clinic gastroenterologist Paul Limburg, M.D., says the goal for each video is the same. "We know that colorectal cancer is a preventable disease, and early detection is critical for saving lives," he says. "We hope to reach all of Mayo Clinic's social media followers and encourage them to share this important information about colorectal cancer within their own networks and hopefully beyond." You can start by sharing your comments below. Then, use the handy social media tools atop this page to share this story with others.